Families and friends joyously gather and celebrate during the holidays. Togetherness is what infuses the gift-giving season with warmth and joy. 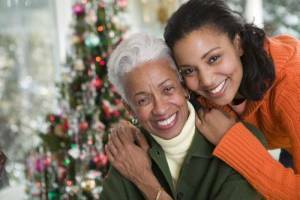 Enjoying the holidays with friends and family takes planning and preparation—and, sometimes, in order to do so, time away from an aging loved one. 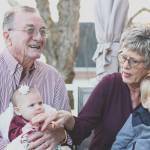 Caring for an elderly family member as the holidays roll around can easily become overwhelming. The afternoon hours a caregiver once had for mom or dad are now apportioned to booking holiday travel, shopping for festive gifts and cooking special four-course meals. Senior care agencies offer a wealth of services designed especially for time-starved family caregivers. 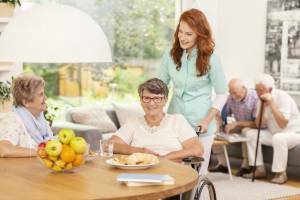 In-home help has increased significance during the holidays. Elderly people, especially during Christmas and New Year, can be plagued with feelings of isolation and loneliness. Cherished friends and spouses have long since passed, leaving many seniors without social support. The holidays can be a depressing time for aging individuals who have few meaningful social opportunities. Professional caregivers are the solution to preventing isolation among seniors during the holidays. A source of companionship, compassionate caregivers take the time to become acquainted with their care recipients, engaging in pleasant conversation, learning about the senior’s hobbies and encouraging rapport. Over time, seniors start to look forward to caregiving visits. Rather than experience loneliness, elderly folks with caregivers have the chance to participate in the meaning of the holidays. Gifts under the tree make waking up on Christmas morning an extraordinary delight. Choosing the right presents requires a few trips to shops glittering with attractive goods. While out gift shopping, caregivers want to know their aging loved one is being cared for. Spending a few relaxing hours at the mall can be accomplished with the help of respite care. 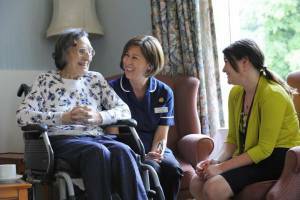 Respite care is flexible and short-term. With respite care, the caregiver can request in-home support for an afternoon or two. A dedicated caregiver arrives to supervise an aging senior, giving the family member ample time to peruse the stores’ merchandise displays. Respite care is doubly beneficial—giving the family caregiver a chance to rejuvenate and return to caregiving duties with increased focus. Another benefit of holiday help is that everyone on the list, whether naughty or nice, is happy with a few well-thought-out gifts—this means the senior in your life, too. Brilliant holiday light displays, nutmeg scented candles and gorgeous ornaments are magnificent home décor. At the same time, these beautiful adornments can be hazardous for a senior. Glass decorations are dangerous if an aging person trips and falls. Elderly individuals suffering from cognitive ailments, like dementia, may forget to turn off the Christmas tree lights or snuff out the candles at night. Fire hazards and injuries like these can be prevented with a caregiver’s supervision. Caregivers from home care agencies are trained in fall prevention and ensuring that seniors’ homes are safe. While on duty, caregivers ensure the environment is free from the dangers of fire, especially when the home is lit up for the holidays. Seniors can enjoy the warm glow of candles, while their families feel comfort in knowing a trusted caregiver is steps away. Roasted turkey dripping with juices and flavorful baked potatoes don’t appear in an instant. An adult child may be cooking up a storm in the kitchen all day, yet mom or dad still requires constant supervision. A caregiver can step in to ensure the family member has plenty of time to cook her special holiday sauce, while the elderly loved one is cared for. If living alone, aging individuals are likely to find cooking an extravagant holiday meal to be difficult. A part of a professional caregiver’s duties is to help with meal preparation. A caregiver is available to grocery shop for fresh produce and cook nutritious meals. Having a caregiver around also ensures the stove is turned off and the dishes are done. 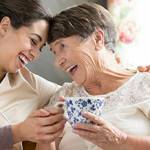 As the holidays approach, family caregivers’ schedules may be overloaded with errands. Rather than fight the frenzy of insurmountable, seemingly never-ending, must-do tasks—hire a caregiver. Professional caregivers will transport your loved one to physical therapy appointments and doctor’s appointments. When an aging family member has gifts of his own to send, a caregiver is available to provide transportation to the post office. Errands are accomplished hassle-free when a dependable caregiver is at hand. A part of the joy of the holidays is the family’s togetherness. School is out for the holidays, so the kids need just as much attention as an aging parent. Rather than experiencing the stress of simultaneously juggling the care of small children and an older adult, family caregivers benefit from the services of an elder care service provider. Bathing, dressing and grooming aging seniors are included in a caregiver’s routine responsibilities. The senior receives assistance with hygiene and is prepped to attend the family’s holiday events in style. Reduce the stress of the holidays and share in the generous spirit of the season by hiring a professional caregiver. 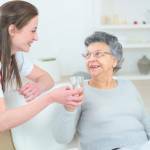 In-home care is available through reputable homecare agencies, like Assisting Hands Home Care. Elder care service providers offer a wealth of support for families and their aging loved one. 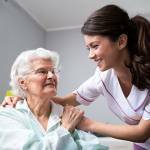 Assisting Hands Home Care offers several non-medical elderly care services, including Alzheimer’s and dementia care, fall prevention, 24-hour care, live-in care and respite care, among others. The responsive Assisting Hands Home Care team meets with the family and care recipient to create a detailed care plan. Loved ones receive optimum care from the compassionate caregiving team at Assisting Hands Home Care. Serving the northern suburbs of Chicago, Assisting Hands Home Care gives seniors and their families the extra support they need, during the holidays and at any time of the year.